Integral Chile were established in 1992 and offer a wide range of freight and logistics services. As per their commitment for continuous improvement, the company has been awarded certification for their excellent services in medicinal products transportation. 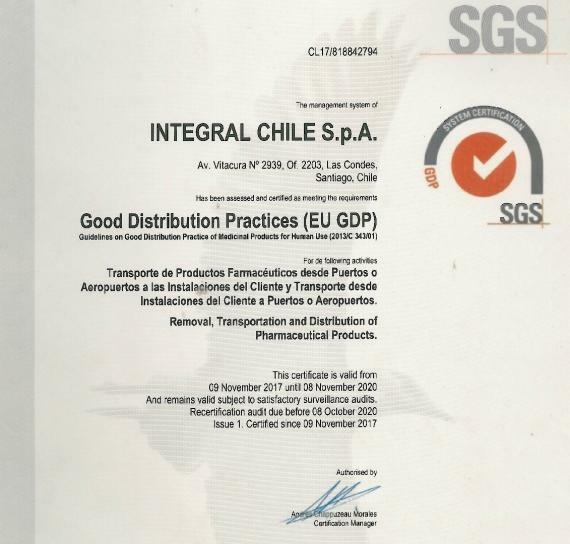 The certification was received for Good Distribution Practices of Medicinal Products for Human Use by SGS Chile – one of the world's leading testing, inspection and verification companies. Dalia Córdova (Director): "I am so glad that Integral Chile has been recognised with this certification. This effective quality management system will help to demonstrate that the processes and procedures are controlled by a staff trained in the subject to ensure that the required standards are maintained throughout the supply chain. I want to thank the customers, suppliers, agents and all our team. This would never have been possible without the support of our General Manager, Miss Elena Zapata and our specialist in the field, Mr Jesus Gonzalez who worked very hard to get the certification and offer this advantage to all our clients and agents worldwide."